This week my elder son will ccelebrate his Confirmation. And suddenly I realised I have never made a Confirmation card before! 🙂 So today I bring you two cards for this occasion, one for a girl and the other for a boy. I kept the design pretty simple, with light background papers, delicate flower combos and filigree chipboard pieces. I decided not to use patterned papers in the background and instead added some texture with die-cut doilies. I think they turned out quite nice, delicate and fit for the occasion. And I really like the subtle look with Monochrome papers in the background, with just a hint of a pattern and still very decorative. What do you think? 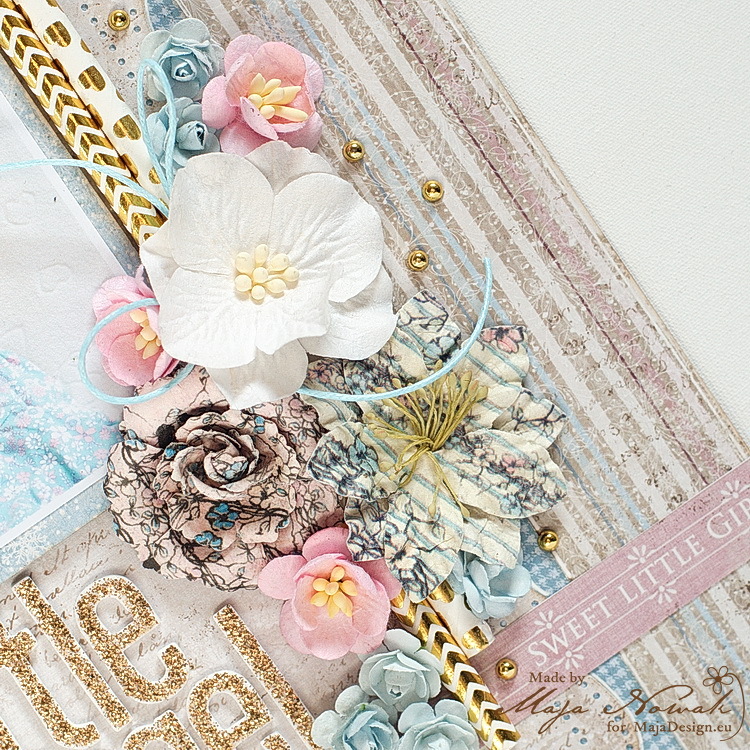 Other: dies: Prima, Cheery Lynn Designs; flowers: Wild Orchid Crafts; chipboard: SnipArt; acrylic stones: Prima. I mounted the layers of papers on pieces of cardboard (great way to use up delivery boxes 😉 ) so they don’t look flat against the flowers. And I really love the dimension it gives! Other: stamps: Altenew; flowers: Prima, Wild Orchid Crafts; stickers: American Crafts, Piątek Trzynastego; chipboard: Miszmasz Papierowy; Distress inks, glitter: Ranger; sequins, bling: my stash. That’s all for today, thank you for visiting and keep dropping by for more inspiration every day! I have recently had the pleasure of making a sweet birthday card for a sweet girl. I also added plaid ribbon and some mini flowers and cute white pom-poms as the finishing touch. And I think the card symbolises the 9-year-old girls quite accurately: still cute, but not too much 😉 What do you think? Other: dies: Marianne Design, Craft Passion; stamp: ScrapBerry’s; flowers: Wild Orchid Crafts; ribbon: Rayher, pom-poms: my stash. As a cherry on top, I stamped “You are perfect” in the lower corner. I really love how the papers and patterns compliment the cute photos of the baby girl 🙂 What do you think? Other: letters: American Crafts; flowers: Prima, Wild Orchid Crafts, my stash; die: Prima; punch: Martha Stewart, mold: Prosvet; stam: ScrapBerry’s; paper straws, gold drops: mys stash.